The incomparable Georges Rouault – Where's my paintbrush? My favorite artists for as long as I can remember have been the Spanish masters – Velazquez, Goya, El Greco, Picasso. One of the reasons for this favoritism is my Spanish origin and heritage. Another is that I was privileged from a very young age to see their masterpieces over and over in person on our summer trips to Spain, not just in art books and documentaries. These experiences instilled a love of art and a desire to educate myself further on art history. I took two classes in college and have always made it a priority to visit museums on trips to any major city. I felt I had a very good understanding of art and of the best artists. I was therefore humbled when Michael, my art instructor, introduced me to an artist I had never heard of, Georges Rouault (1871-1958), and suggested I do a study of one of his paintings. 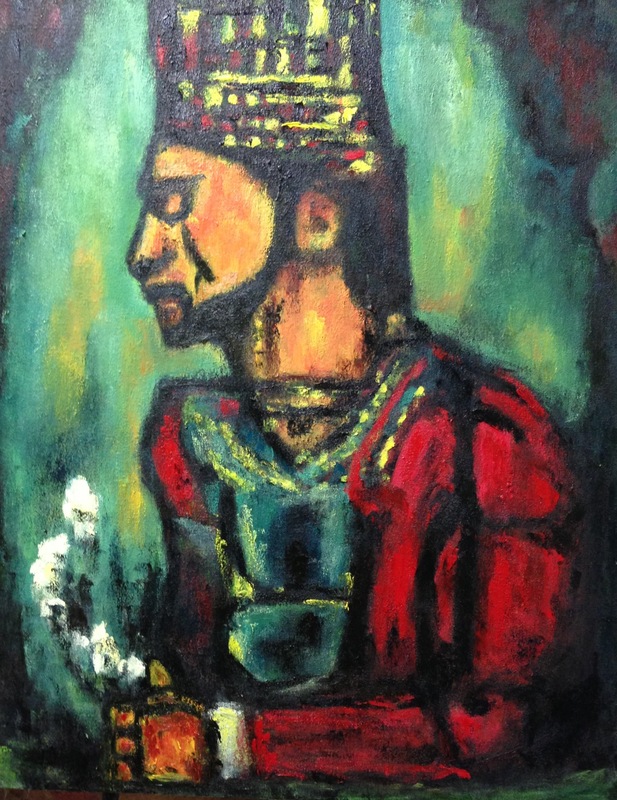 As I described in previous posts here and here, I’ve been working on a study of Rouault’s The Old King. His influence on Michael’s work was immediately obvious to me, and the more I worked on The Old King, the more I was in awe of this little known, yet extraordinary, painter. So I thought I’d share what I’ve learned about him through the process of studying his masterpiece. I would also like to share my completed study of The Old King at the close of this post. It turns out that at one time, Rouault’s reputation was on par with Matisse’s, and he was extremely popular in the 40’s and 50’s in the aftermath of WWII. He was so beloved at his death at 87 that France entered into national mourning and he was given a state funeral. Then he somehow slipped out of favor and was labeled an “acquired taste.” The New York Times recently said, “The art has a sanctimony and sincerity that resonated after the war but came to seem dated in an art world besotted by American Pop and bling.” His paintings have been labeled gentle, religious, tender, moral, and peculiar. 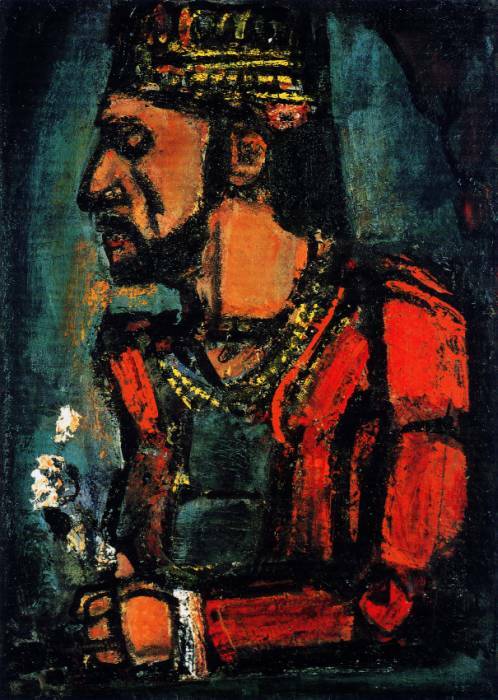 Having studied his painting The Old King for weeks now, I feel like I must do my tiny part to help the art community continue to restore Rouault to a rightfully respected place in modern art. Rouault worked as a stained-glass restorer as a young man, and this influence on his paintings is evident in the thick black lines and glowing colors against atmospheric backgrounds. These luminous colors and incredible lines give his paintings an expressiveness and richness that I personally experienced as I studied his work. It takes time – and a lot of paint – to build these thick layers of dense color on the canvas. 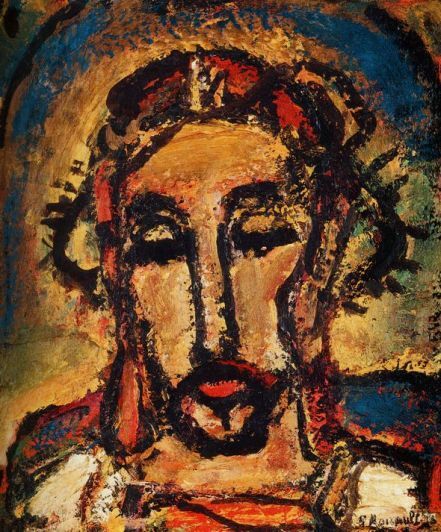 I read that Rouault never felt his paintings were truly finished, and I understand that now. I could have kept on building up color for weeks on my study. 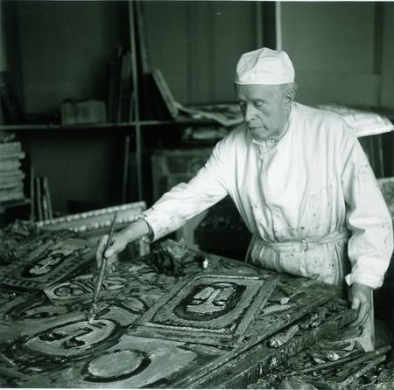 His art dealer, Ambroise Vollard, made a deal with him in 1917: for providing Rouault with financial security and a studio in his home, Vollard got hundreds of paintings, most of them unfinished. 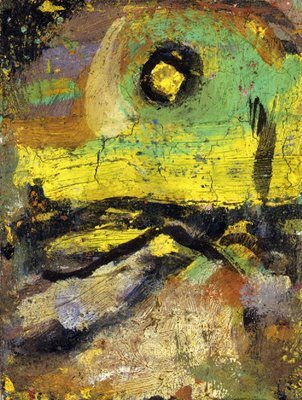 When Vollard died suddenly in 1939, his heirs locked Rouault out of his studio, forcing him to sue to get his paintings back. He had always been very concerned with artists’ rights over their creations, writing, “I sometimes dream, in these last years of my life, of upholding a thesis at the Sorbonne on the spiritual defense of works of art and the artist’s rights before the law, and the ways and means of securing these rights, so that those who come after us may be better protected.“ It took nine years, but at the age of 77, he won the lawsuit, which I learned was a landmark case in artist’s property rights, and he recovered over 800 paintings. Knowing that at his advanced age he could never finish all the paintings, he burned 315 of them before witnesses. Today the estimated worth of those lost paintings is $500 million. Some believe his act was not symbolic or profound, that he just knew he wouldn’t finish the paintings, so why leave them lying around? Another, more romantic theory, is that after the lengthy legal battle and years lost, he wanted to show that only he controlled his work. He was very popular when his paintings went up in smoke and he could have made a fortune. Instead, maybe he was teaching a moral lesson in the true value of art. 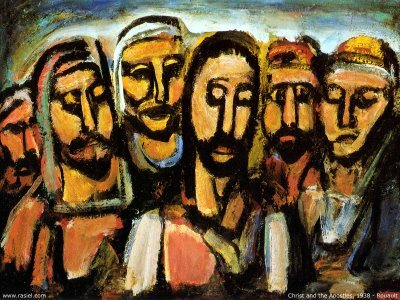 I’m very grateful to have been introduced to Rouault and to have studied The Old King. I have no doubt that I will continue to explore his art and that he will influence my work moving forward. How about you? Is there someone (artist, writer, poet, performer) unknown to the masses who has influenced you? Note to my readers: Part 2 on Creativity as Competitive Advantage will publish next week.